A former aide of Osama Bin Laden has been sentenced to life in prison for aiding in the bombing of US embassies in east Africa in 1998 that killed 224 people. Khalid Al-Fawwaz was arrested in London the same year as the bombings, and was extradited to the US 14 years later. Al-Fawwaz has been called Bin Laden's spokesman and al-Qaeda's media adviser in London. The Saudi national, was convicted in February of four conspiracy charges. 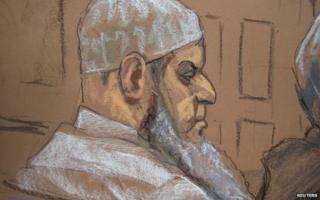 Prosecutors say he operated an office in London where he disseminated Bin Laden's fatwas, or religious decrees, to media outlets. A statement from Preet Bharara, the US Attorney for the Southern District of New York, called Al-Fawwaz "bin Laden's bridge to the West." "Fawwaz conspired with a murderous regime, and the result was a horrific toll of terror and death," Mr Bharara said. "The price he will pay, appropriately severe as it is, cannot possibly compensate his victims and their families." Al-Fawwaz was also accused of using the office to send communications equipment, including a satellite phone, to the al-Qaeda leader. The sentence was read out by a Manhattan jury at a heavily guarded downtown courthouse. Lawyers for al-Fawwaz argued that he was a peaceful political dissident and not a violent terrorist. "My goal was reform, not rebellion," said al-Nawwaz to the victims present in the courtroom.